Dux Hot water systems are an Australian manufacturer of Electric hot water systems, Solar hot water systems and Heat pump hot water systems. Dux hot water systems are designed and manufactured in New South Wales from the highest quality materials for Australian conditions. SA Hot Water™ repair all Dux hot water systems which includes, Dux Electric hot water repairs, Dux gas hot water repairs, Dux solar hot water repairs, Dux instant hot water repairs. 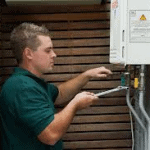 Our Adelaide plumbing service provides same day repairs your Dux hot water system and can be arranged by calling our hot water hotline on 8444 7320. Dux Hot Water Repairs Best Price!